Looks like timeout I've made with writing articles for my book is finally long enough and #socialmedia scope has significantly evolved. Pinterest itself has grown up and went business. Business accounts appeared and Buy button comes out. Hootsuite launched posting to Pinterest functionality in a week or so after. Now I must admit that I haven't tried/tested properly those new arrivals. Sou You can make boards, pin (post), re-pin (re-post/re-blog) and like naturally. So actually it's multi-blogging platform and the first as for me. Pinterest supports only Facebook and Twitter sharing. Sure You can follow people and You'll realize pretty fast that the boards not people are for following, You hardly can find a person with all the similar interests but You have one or several interests shared with lots of different people. 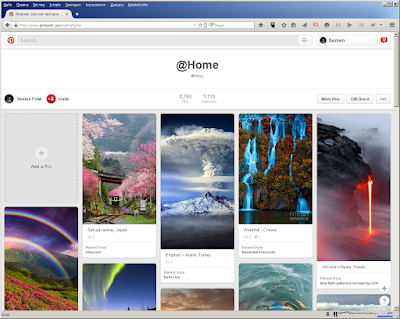 Like the other socialmedia Pinterest allows to pin (publish post) from url, pin button on page or with browser plugin button or directly upload images. The only thing to add is communities: the board (blog) that run by lots of contributors. Also there is private data and it's named secret here. Fresh neat UX design, strong tech and tasty aesthetics made rocket launch and then one of the most popular socialmedia resources for now. The next article is still about G+ and Instagram goes after it.